Lynx Technology Partners, one of the Information Technology Industry’s Hot Companies and Best Products Award Winners, will be honored at the 2016 SVUS Red Carpet Awards Ceremony Dinner in San Francisco, California on Monday, June 27, 2016. New York, NY, May 19, 2016 (Newswire.com) – Lynx Technology Partners (Lynx), a trusted cyber security and IT risk management advisory firm, has been named by Network Products Guide as the Security Management Team of the Year Gold winner in the 11th Annual 2016 IT World Awards. The industry and peer recognitions from Network Products Guide are the world’s premier information technology awards honoring achievements and recognitions in every facet of the IT industry. Global winners, including Lynx Technology Partners, Bloomberg BNA, Dell, Arbor Networks, and Radware, will be honored in San Francisco, California on Monday, June 27, 2016 during the 2016 SVUS Red Carpet Awards Ceremony Dinner. Lynx was awarded three awards, including the Management Team of the Year Gold Winner for Security Services. The award recognizes the outstanding leadership and contribution to growing the business by Aric Perminter, Founder and Chairman, and the Executive Team Members: Rich Hlavka, Chief Executive Officer, Gina Mahin, Chief Operations Officer, David Elcock, Chief Business Development Officer, Bobby Dominguez, Chief Security and Strategy Officer, and Steve Brewer, Chief Technology Officer. It’s an honor to be recognized as the Gold winner for Cyber Security Management Team of the year by Network Products Guide IT World Awards. As one of the fastest growing security firms in the US, our experienced and agile management team is driving our growth and supporting our customers with a holistic approach to IT GRC and Cyber Security. Lynx Technology Partners also won two Bronze IT World Awards for theirCyber Security Solutions and IT GRC software solution, Lynx Risk Manager, which reduces time and costly errors in IT compliance and risk management. With Lynx Risk Manager, customers can simply harmonize IT compliance requirements and standard security frameworks like ISO27000 and NIST to enable an “Asses-Once, Comply-with-Many” capability. As a result, enterprises in highly regulated industries can reduce their overall audit burden and cut the cost and complexity of compliance while improving the effectiveness of their security program. The Lynx Management Team includes experienced, industry-recognized experts who have led governance, risk management, compliance, and cybersecurity programs and served as subject matter experts for Fortune 500 enterprises and federal agencies. In addition, Lynx Technology Partners has been recognized as INC 5000 top growth company, and the Silicon Review recently named Lynx as a top 20 fastest growing security company. For more information, visit LynxGRC.com. As industry’s leading technology research and advisory publication, Network Products Guide plays a vital role in keeping decision makers and end-users informed of the choices they can make in all areas of information technology. The Annual IT World Awards is part of the SVUS Awards® recognition program from Silicon Valley, California. 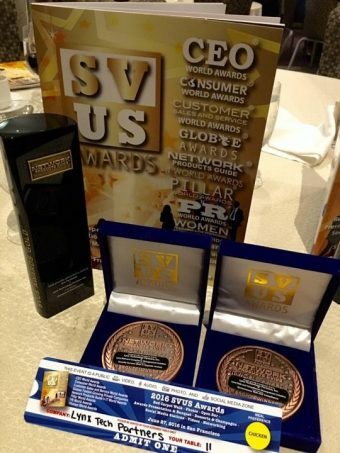 It also includes other programs such as CEO World Awards, Consumer World Awards, Customer Sales and Service World Awards, Women World Awards and more. To learn more, visit NetworkProductsGuide.com.